A Look or 3D LUT is a simple but very powerful way to apply a color grade to footage. 3D LUT files are quite small, (often around 1MB) and can be produced with most any color grading software and can be saved on to an SD card for use on the monitor or at any point in post production. 3D LUTs are particularly powerful when used with SmallHD monitors - many can be applied simultaneously on several pages so visualizing color variants on set is made as easy as swiping from page to page. In this section we'll place a downloaded look on an SD card and apply it to a page. Using a computer, place as many Look files as you wish onto an SD card. 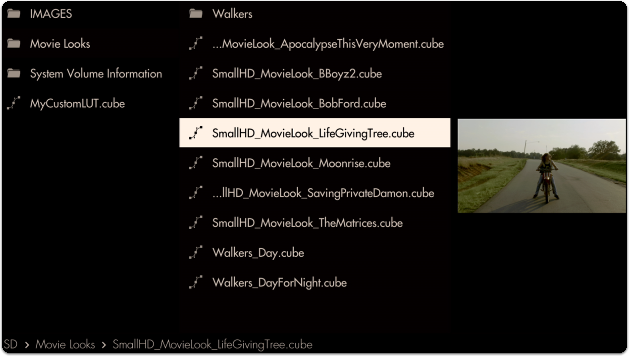 For this example we'll be using our very own "Movie Looks" pack that you can download here for free. 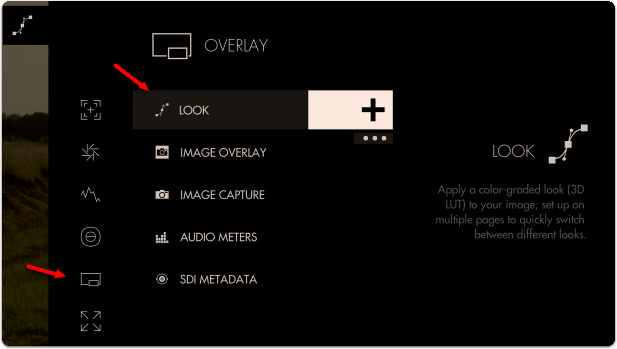 With the LUTs placed on the SD card, insert it into your monitor. From any page with a video feed, click the joystick or tap the screen to bring up ‘Add New Tool’ and navigate to Overlay > Look. You will then be presented with a file browser where you can select your Look. You can see a preview before making a selection. The Look is now applied to the page. To get the most benefit out of this feature, try applying different Looks to several pages to switch between them at any point to help inform your decisions about how to approach any given shot! Access Look tool settings menu by navigating right/pressing the right arrow when Look is highlighted in the tool list. 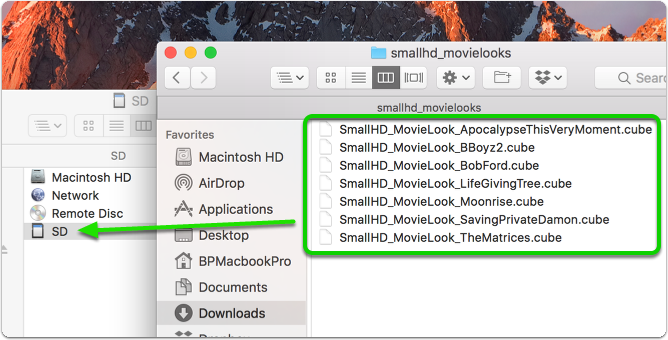 Select this option to switch to a different Look file from an SD card or the monitor’s internal memory. This setting lets you scale back the effect of the Look for situations where color & value are being pushed too far. 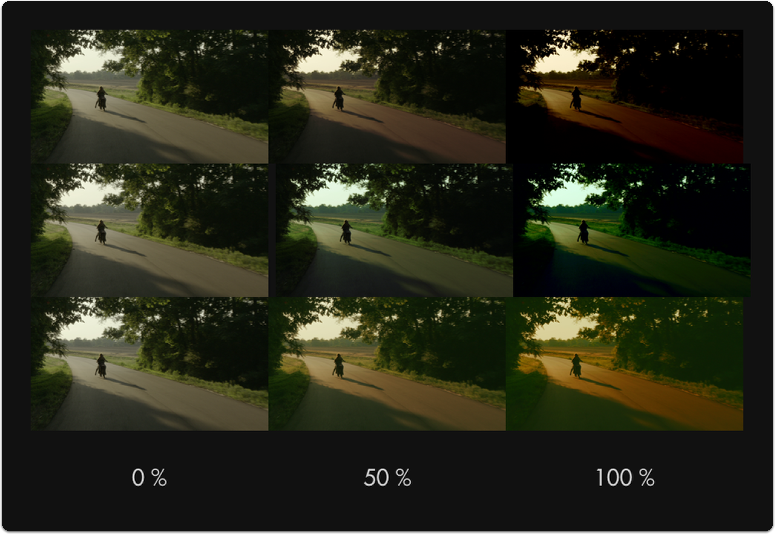 Leave this at 100% if you wish to maintain accuracy of the LUT. For LUTs with a high default intensity, this is a great option to be able to visualize a 'toned down' version - just apply the same LUT with the same intensity in your color grading application to match the look on set! If your LUT has been designed for ‘legal’ broadcast range (16-235 for 8-bit, 64-940 for 10-bit), use this setting so that your signal gets displayed properly. If you aren't sure what this means, leave at the ‘full’ setting. This setting currently mirrors the selection of ‘Input Data Range’ - splitting input/output data ranges is on the roadmap for a future firmware update.